This week we have reviews of two new mysteries by Anna Celeste Burke. Details at the end of this post on how to enter to win ebook copies of both books and links to purchase them from Amazon. Anna Celeste Burke is excellent at penning engaging cozy mysteries: clever plot lines, realistic characters, a bit of nail-biting, satisfying solutions. All of her series highlight the wonders of California like a peripheral character from the Coachella Valley to the Central Coast, then from the OC to the American Rivera just north of Santa Barbara to California’s wine country in and around Calistoga. This has made me an eager fan of her three established series and the two new ones released in the last two months because I know I’m in for an entertaining experience. A Tango Before Dying Georgie Shaw Cozy Mystery earns 5/5 Tango Twists…Totally Engaging! The first of seven books was published in 2016 with Murder at Catmmando Mountain. Georgie Shaw was the public relations exec for Catmmando Tom, a famous cartoon cat superhero, now she is a corporate VP for Marvelous Marley World. Along with an egocentric, I mean eccentric, boss “Mad” Max Marley, executive assistant Carol Ripley, and handsome detective/now husband Jack Wheeler, Georgie happens upon mayhem and murder…always uncovering the truth, but not without a bit of nail-biting peril. “When Trouble Waltzes In, You Don’t Always Know It…” Georgie and Jack are having lunch at a Versailles-inspired restaurant at Marvelous Marley World eager to be joined by Georgie’s executive assistant Carol and her well-renowned dancer/namesake/godmother Charlotte Carol Chantel. Heads turn, cameras flash, and waiters gush as Madame Chantel glides gracefully through the crowd enjoying the attention, but her entrance is disrupted by a disgruntled competitor. The World Ballroom Dance Competition is set and accusations of fixing punctuated by a thrown glass of wine isn’t enough to sour the festivities. 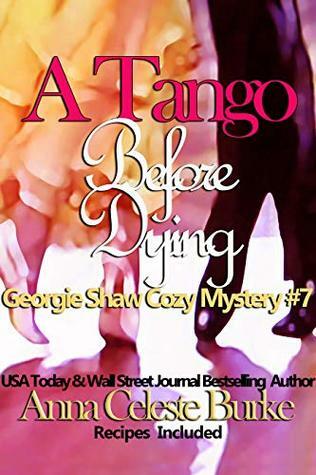 Well, maybe the dead body is… Carol desperately pleads for Georgie’s help to find her godmother’s killer, and Max, who seemed more than just a fan of the “vibrant, enchanting woman,” wants them to drop everything to do so. Another big thumbs up! This page-turner journey toward a great reveal included lots of possibilities, twists and turns, and times I thought I got it, then nope…so much fun! Anna penned an engaging first-person narrative from Georgie’s “I” perspective sharing her inner thoughts along with vivid descriptions and entertaining banter. Although all of Anna’s characters are strong and relatable females, Georgie Shaw is my favorite. She is easily identified with as a woman “of a mature age,” as well as intelligent, humorous, and acts/reacts to the drama with realistic responses. She has a loving, collaborative relationship with now husband/detective Jack Wheeler who supports her “nosy” manner, joining in, when a suspicious death occurs. I enjoyed having the focus settling on and getting personal insights into Georgie’s assistant Carol. So, all-in-all a great read! Extra Bonuses! I have been a long-time fan of Anna’s work and always eager to find what recipes she’ll include as an extra treat. This book includes Mushroom and Gruyere Tarts (gonna try this first), Steak Au Poivre (an all-time favorite I used to make with minute steaks), Meringue Baskets with Berries, Jack’s Favorite Spiced Cookies with a dash of Irish Whiskey, Blueberry Coffee Cake (yummy), and The Bombe! Alert! I am also thrilled and honored about “Kathleen Fowler” character! My namesake…well, my maiden name. She pops up regularly, and I am thankful she was not the….no spoilers here! 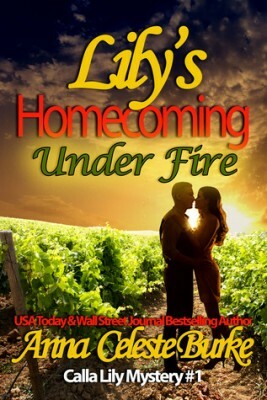 Lily’s Homecoming Under Fire Calla Lily Mystery earns 5/5 Cabernet Conundrums…Clever! DUCK! Introducing Lily Callahan! STAY DOWN! Introducing Deputy US Marshall Austin Jennings! Anna Celeste Burke has released the first book in a new series taking us from her California desert cities to California wine country all in a shower of bullets. Lily is fine, the cabin destroyed, and the gunmen ultimately brought into custody, but answers to Deputy Jennings’s questions seem unclear. Why is a hired gun after her…Crazy fan? Dumped agent? Insurance scam? Inheritance squabble? Lily is a former actress on the popular soap “Not Another Day,” and although it’s interesting that life may be imitating art since her early retirement from Hollywood is due to her character’s demise, attempted murder seems an overreaction. Wow, what a way to start! During an informal “Why are you a target?” discussion, Lily reminisces about her childhood along with her aunt’s Auntie Mame-like rescue from her dysfunctional family. But, it was her Aunt Lettie’s untimely and unexpected heart attack, that brought Lily home to take possession of her inheritance…a vineyard, a winery, and the house she grew up in along with disgruntled family, partners, and high school friends. So, what comes next? Who knew Lily was coming home? And what are the details behind Aunt Lettie’s death? At least she has a very handsome bodyguard and her Miniature Pinscher Marlowe to keep her safe. Wow! I am a big fan of Anna’s writing style which keeps me coming back for more. She always has a clever plot that unfolds slowly with more than a handful of suspects with motives, twists, turns, and someone is always in peril. But, she weaves in everyday life…here, it’s Lily’s journey with the vineyard and winery. Her use of the ”I” perspective always puts me in the middle of the action…here, I’m Lily for a time wrapped in the hunky’s arms or dodging danger! She includes vivid descriptions of the opening gun fight, then the house, the vineyard, the people, tone, and emotion enveloping me in such sensory details. I enjoyed the romance dance between Lily and Austin, and the way Anna gives realism to character interactions. I highly recommend this book…this series leaps to the top of my nominations for Best in 2019! Be a Big Anna Celeste Burke Fan! To enter to win ebook copies of both books, simply email KRL at krlcontests@gmail[dot]com by replacing the [dot] with a period, and with the subject line “celeste burke,” or comment on this article. A winner will be chosen February 16, 2019. If entering via comment please include your email address. You can read our privacy statement here if you like. Check out other mystery articles, reviews, book giveaways & mystery short stories in our mystery section. And join our mystery Facebook group to keep up with everything mystery we post, and have a chance at some extra giveaways. Also check our our new mystery podcast! A new episode went up this week. New to me author. Sounds like great reads! These books sound great! Would love to have a copy! Sounds like these will be some great reads! Thanks for the informative reviews!! This is fantastic! Thanks so much for the chance! Great author, both books sound amazing. I’m a ballroom dancer myself. It’ll be interesting to read another perspective on the activity. I love Anna Celeste Burke ‘s books and recipes!Thanks for the chance to win this wonderful book!